The American Public Transportation Association (APTA) recognized seven organizations for their outstanding sustainability achievements that have met specific criteria through the APTA Sustainability Commitment program. Public transit agencies and businesses that voluntarily participate in the APTA Sustainability Commitment program commit to implementing processes and actions that create continuous improvements in environmental, social and economic sustainability. Depending on the level of achievement, organizations were presented Gold, Silver and Bronze level certifications by APTA Chair Peter Varga at the APTA Sustainability and Public Transportation Workshop, which is being held at the Omni Parker House Hotel in Boston. 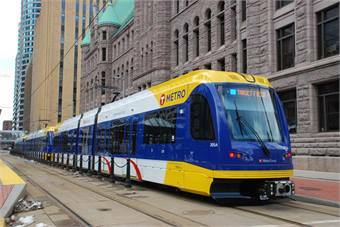 The organizations receiving Gold Level recognition were Ill.’s Champaign-Urbana Mass Transit District; Boston’s Massachusetts Bay Transportation Authority; Minneapolis’ Metro Transit; and the Société de Transport de Montréal. Springfield, Ore.-based Lane Transit District received a Silver Level Recognition, while the two Bronze Level recipients were Toronto’s GO Transit and Stacy and Witbeck — the first construction firm to receive this honor, for the sustainability efforts at its Portland, Ore. office and four project field offices.